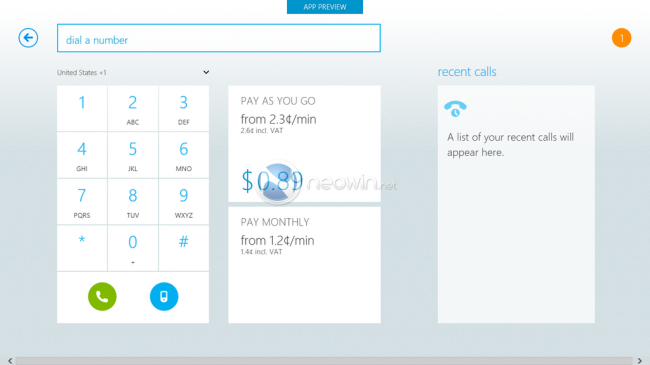 A new version of Skype has been built for Windows 8 when the OS launches. This of course can be expected. What I didn’t expect to see today was more images of the new Skype app and what it runs like on the “Metro” style interface. NeoWin managed to spend some time testing the app to see how it runs. At the moment the app is in a preview state which means it is almost ready for launch after a few more tweaks. Generally, it runs quite stable at the moment and allows calls and chats to be made without issues. NeoWin has also commented that the app performs very well in terms of speed. They described the app as fluide and fast. It has also been classed as being finger friendly which essentially means that it will work well on a tablet and be responsive and accurate to your fingers tapping around the screen controlling it. It looks like Microsoft has done a good job with the app. The previous version wasn’t liked as much although this new version seems to work well. The app uses different colours for different conversations which helps you more easily distinguish between them. Also, text is supposedly a lot clearer making it easier to use for text chat. As the app appeared to be finished, NeoWin commented that the app will likely launch very soon. I’m not sure if that means it will launch same day as Windows 8, but they seemed to indicate that it was almost ready to be made available.